Wednesday I blogged about how to deal with rejection. Go ahead, you can read it. Click HERE. I wanted to tell you about the 3 rejections that made me smile. In fact, that made me a little giddy. 1. When I finished the very first draft of Paint Chips I naively thought it was ready to be seen. Ugh. I seriously want to smack myself in the face for thinking that it was polished. Anywho. I sent query letters (in the biz, these are letters asking agents and/or editors if they’re interested in our project), proposals (basically an overview of the work, the author’s street cred, and is worse to write than the actual novel…I’m not kidding), and sample chapters (typically the first 3 chapters) to agents. 11 of them. I received 11 rejections. Did you see that? I have flashes of good writing. I HAVE FLASHES OF GOOD WRITING!!!!! Yeah. He also said the novel needed work. But the flashes are there! Jeff thought I was off my rocker at how I danced around the house after receiving this letter. And, yes, I keep this letter in a very safe place. It’s one of my treasures. 2. After many, many, many revisions to Paint Chips, I had a book contract with WhiteFire Publishing and was looking to add an agent to my career. I queried an agency that is in my city. The answer I got back? Not now. And what did the agent say? “I believe in your writing”. And, guess what! I signed a contract with her as my agent last fall. Her name is Ann and she’s one of my favorites…she would be even if she wasn’t my agent, though. She’s fabulous. 3. This week, I received a rejection from a BIG publishing house. I was bummed, but not enough to feel like crying. My skin is becoming thick as raw hide. An editor that I deeply respect had done his work, passing a proposal and sample chapters of my novel (the one I’m writing now) around. No bites on it. But then that editor told me that he had faith that I would find a home for the story. His words prodded me on, made me want to write the best story I possibly can. Rejection isn’t fun. It isn’t something we necessarily want. However, it can be a turning point in a career. A life. It’s all in the way you look at it. Hey, I’ve got a give-away going on…You could win a signed copy of My Mother’s Chamomile for you or someone you think is pretty cool. Click HERE to enter! ← Aw Snap…Mother’s Day’s Coming! I’m LOVING My Mother’s Chamomile!! Thank you, thank you, Debra! 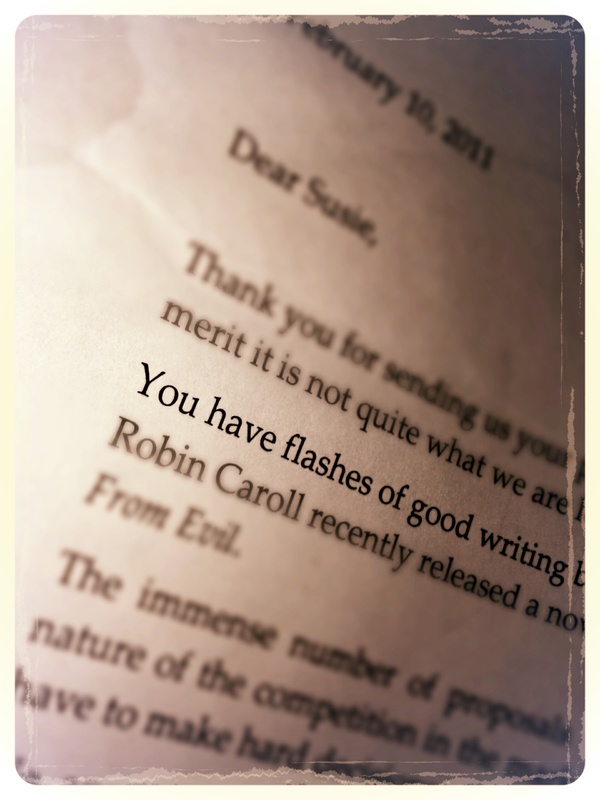 I like to focus on the good rejections…and take the icky ones with a grain of salt. Although, I haven’t had many of those. Best wishes on your agent search! When you get a NON-rejection, you’ll have to have a big celebration! Right now it’s hard for me to see past the rejections, but I’m learning. It’s kind of a head down move forward sort of thing. I’ve been there, Jessie. I do understand. But keep going, keep learning, keep loving the writing part.